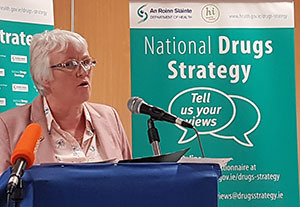 Minister of State for Communities and the National Drugs Strategy, Catherine Byrne TD, has announced details of a public consultation on the new National Drugs Strategy. The new Strategy will set out Government policy on tackling the drug problem from 2017 onwards. Minister Byrne said: “The development of the new National Drugs Strategy is essential to ensure that we have an up-to-date and effective response to the drug problem facing our society. We are planning for a future where Ireland is a better place in terms of drug prevention, where people can make informed decisions through education, and the right services and support are provided to those who need them most. Now is the chance to have your say and inform Government policy on this key issue”. The public consultation process will run for six weeks, from Tuesday 6th September until 5pm on Tuesday, 18th October 2016. During the consultation, the Department is seeking the views of the public and all interested parties on the drugs situation in Ireland to help inform the new Strategy. At the end of the public consultation, the views received will be compiled in a report. The report will be provided to the National Drugs Strategy Steering Committee to assist in the development of the new Strategy. The National Drugs Strategy aims to tackle the harm caused to individuals and our society by the misuse of drugs. Drug misuse is the use of any drug, legal or illegal, which harms or threatens to harm some aspect of an individual’s life, be it physical, mental or social well-being, or other individuals or society at large. Illicit (or illegal) drugs – for example cannabis, ecstasy, amphetamines, cocaine, new psychoactive substances, magic mushrooms, LSD and heroin. Prescription medicines – Legitimate (or legal) medicines which are ordinarily prescribed by a doctor, dentist or nurse, which may have the potential for misuse e.g. medicines prescribed for the relief of pain, to aid sleep, anxiety or depression. It includes the harmful use of prescribed medicines by exceeding the recommended prescribed dose or duration of use, or using such medicines when they have not been prescribed for you. Over the Counter Medicines (OTCs) - Legitimate (or legal) medicines which do not ordinarily require a prescription and includes the harmful use of such medicines by exceeding the recommended dose or duration of use e.g. painkillers containing codeine. Solvents – for example aerosols, glues and gas lighter refills. Alcohol – for example beer, cider, spirits, wine and alcopop drinks. To help you think about the issues that you feel are important for the new Strategy, this questionnaire uses the pillars of the existing National Drugs Strategy of 2009-2016: Supply Reduction, Prevention, Treatment, Rehabilitation and Research. Using the online questionnaire or complete and return to the P.O. Box address provided below. A series of public consultation meetings on the new Strategy will take place in (1) Landmark Hotel, Carrick-on-Shannon, Monday 12th September 2016; (2) Limerick Strand Hotel, Limerick Wednesday 14th September 2016; (3) The Metropole Hotel, Cork Thursday 15th September 2016; (4) Alexander Hotel, Dublin, Monday 19th September 2016To register your interest in attending these events, please email yourviews@drugsstrategy.ie. If you have any difficulty completing the online questionnaire or would like to request a printed copy, please contact us using the details above.